For some reason it took me a while to try an avocado in my smoothie, but now it’s one of my favorite ingredients. Avocados give your smoothie a rich and creamy consistency while providing an array of health benefits. Here are a few avocado health highlights. 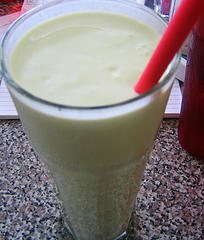 Now for the creamy avocado smoothie recipe, which I find keeps me satiated for hours. Enjoy! I would love to know if you try this creamy avocado smoothie – please leave a comment below. Happy Blending! Thanks for the kind words, Lore! That really means a lot considering the time and effort I put into the site. Cheers! I would really like to know how healthy (or not!) a smoothie I have put together this morning without a recipe please. It is the first one I have done without a recipe that I have thoroughly enjoyed and would appreciate your views. Sorry I couldn’t find where to post this as a separate request to this post!! Your ad hoc smoothie recipe is definitely healthy! It must have been creamy and delicious with a whole avocado. My only minor critique is that it might be a little high in sugar; so you could use only 1/2 banana and/or 1/2 mango next time. I WOULD LIKE TO TRY THIS SMOOTHIE WHEN I HAVE ALL OF THE INGREDIENTS.I HAVE AN AVOCADO,AND A BANANA.I WILL BUY A CONTAINER OF UNSWEETENED ALMOND MILK,CHOCOLATE PROTEIN POWDER,FROZEN BERRIES,AND SUPERFOOD POWDER SOON. WHERE CAN I BUY CHOCOLATE PROTEIN POWDER,SUPERFOOD POWDER ?HAS ANYBODY EVER TRIED THIS SMOOTHIE? HOW LONG CAN I KEEP THE AVOCADO IN THE FRIDGE AND STOP IT FROM GOING BROWN? Avocados can be refrigerated once rip for 3-4 days. Hi,I just made your creamy avocado smoothie with most of the ingredients in your smoothie,and wow it tastes really good and I really love and enjoy doing this smoothie. I used the natrel 2%milk,a little bit of the coconut milk and I followed up with almost all of the ingredients in the recipe. hi,I am going to make your creamy avocado smoothie again as soon as I buy some more ingredients to make this smoothie in my blender.would it be ok to put a whole avocado in this smoothie instead of half an avocado? Yes, a whole avocado would make this smoothie that much more nutritious and creamy! hi,i am going to make your creamy avocado smoothie in my blender,but I don’t have any coconut shreds,no mint leaves,but I have everything else to put in your smoothie. can I put coconut extract and peppermint in your smoothie with the rest of the ingredients? can I put a while cut up avocado and chia seed powder in your smoothie? Yes, you can substitute with coconut extract and peppermint and use a whole avocado and include chia seed powder! Let me know how it turns out. Hi,I have all of the ingredients to make your creamy avocado but I have to go buy a couple of avocados,I don’t have frozen mixed fruit but I have Saskatoon berries in the fridge store.can I put these berries in your smoothie? Yes, Saskatoon berries will work great, Kim. I just made your creamy avocado smoothie again,this time i added three more add ons to the smoothie which i am drinking while writing this note on your website,it tastes even better than the first time that i made your smoothie,it tastes really good,nice and thick the way i like drinking healthy smoothies. Hi,I just made your creamy avocado smoothie with all of the ingredients,two add on and the berries and it tastes really good,and I put a little bit of chia seed powder in your smoothie,I was impressed with this smoothie,it tastes much better. Hi,I just made your creamy avocado smoothie,and this time i put a bit of frozen cherry strawberry fruit in it with five other ingredients into my smoothie,and it tastes really good with the chocolate protein powder and 1 stevia packet in your smoothie. Very good, Kim! Thanks for sharing. Hi,i made your avocado smoothie three times now and i put chia seeds in your smoothie and it tasted really good,it was like eating an avocado chia seed pudding.